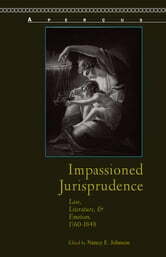 In this volume of essays, scholars of the interdisciplinary field of law and literature write about the role of emotion in English law and legal theory in the late eighteenth and early nineteenth centuries. The law’s claims to reason provided a growing citizenry that was beginning to establish its rights with an assurance of fairness and equity. Yet, an investigation of the rational discourse of the law reveals at its core the processes of emotion, and a study of literature that engages with the law exposes the potency of emotion in the practice and understanding of the law. Examining both legal and literary texts, the authors in this collection consider the emotion that infuses the law and find that feeling, sentiment and passion are integral to juridical thought as well as to specific legislation.